"The best gift you can give yourself is a slim, beautiful, healthy belly--and in this book, Dr. Kellyann, an expert I trust, tells you exactly how to get it." - Mehmet Oz, M.D. 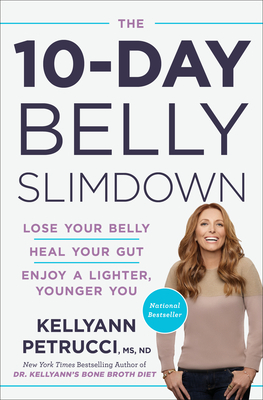 The New York Times bestselling author of Dr. Kellyann's Bone Broth Diet reveals her powerful belly-slimming plan that will help you lose up to 10 pounds in 10 days! Are you sick and tired of your belly fat? Frustrated with diets that don't take it off? Angry that you don't look the way you want to look, and can't wear the clothes you want to wear? Naturopathic physician and weight loss specialist Dr. Kellyann Petrucci has spent over 20 years showing people how to do the impossible: take off stubborn belly fat. After guiding thousands of amazing transformations over her career, Dr. Petrucci has targeted the most powerful ways to flatten your belly--deprivation not included! In The 10-Day Belly Slimdown, you will learn the #1 biggest secret to rapid belly-blasting: "mini-fasting." This simple but revolutionary shift in the timing of your meals means you'll eat within a seven-hour window each day. While you're mini-fasting, you'll never feel hungry--luscious, satisfying bone broth will quench cravings and melt off pounds, collagen-packed shakes will kick your metabolism into overdrive, and "slim-gestion" foods, herbs, and spices will fight bloat, lower inflammation, and cleanse your gut. In combination, these strategies deliver incredible results quickly and safely. The 10-Day Belly Slimdown includes daily meal plans, batch cooking tips to make meal prep a snap, 80 delicious new recipes, and a sensible maintenance plan. As you heal your belly from the inside out, you'll feel younger, happier, and lighter than you thought possible. KELLYANN PETRUCCI, MS, ND, is a board-certified naturopathic physician, certified nutrition consultant, and the New York Times bestselling author of Dr. Kellyann's Bone Broth Diet. She is also a concierge doctor for celebrities in Los Angeles and New York and is featured on the public television special 21 Days to a Slimmer, Younger You. Dr. Petrucci is a regular guest on television shows including Dr. Oz, The Doctors, Good Morning America, and other national news programs.